Today my desk is folded in two. I mean twofold. First, I want to wish all of you a Happy Easter, or a Happy Passover, or a Happy Regular Ol' Sunday, doing whatever makes you happy! Second, this week I continued messing around with some chevron die strips, so after the desk view, there is a chevron "basket weave" tutorial. On my desk you can see a card with an eggy-headed bunny peeking over a 'chevron fence,' and a card with a 'chevron basket' full of sequined eggs. I think I've got you all covered with my weekend wishes! If you need to make like an Easter bunny and hop along, I understand. Thanks for stopping! I hope you'll take a mo to wheel down to the comment section and let me know you came by so I can return the flavor! Happy WOYWW and enjoy your day! No, seriously, enjoy your day. LITS*! I posted this Easter card a couple of days ago and many peeps thought that I wove the chevrons in the basket, or that I otherwise put a lot of time and effort into making it, or just plain wondered how I did it. Toilet paper?! Oh, my, no. The secret of making anything of this sort is to have largish sheets of sticky-backed paper. You can use large shipping labels, or whole single sheets (lots of stamping websites have them), or fly-paper, or a 4.5 inch roll like I have here. My roll was purchased on accident. I heard about these tapes from the "Online Card Class 2" that I took a few months ago and I placed an order with Ellen Hutson LLC. I don't have excellent spatial and mathematical skills, as you know, and I thought I was getting an assortment of tape sizes, so when this big ol' hunkahunka sticky tape arrived, I went "What in the name of Sam Hill is this mahoosive roll of mahoosiveness?" But, hey, my fault for doodling instead of paying attention during the measurements class in grade school. This sucker will last me my lifetime and yours, but it was just the ticket when I wanted to mess around with my chevron strips! I love how life always works out. 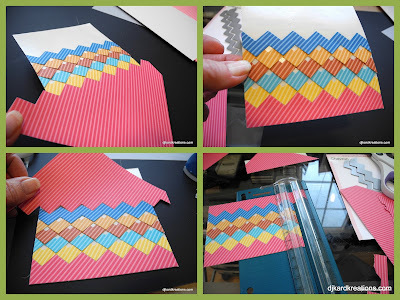 So you start with a piece of sticky paper and you make some cutout chevron strips with whatever die or skizzors process you use. Then you just start laying your strips on the sticky piece. I didn't pay attention to my color arrangement for this, so ignore that. Unless you really like it, then you can comment, "Wow, I really like the color arrangement you used!" Next you just line up the mountain of one row with the valley of the other for as many rows as you want. When you're done with your rows, you have to trim the sides and "finish off" the top and bottom of your faux weave. For this tute, I just used a "mountain" snippet piece for both, which I then trimmed. What you'll notice next is that you can see and touch the adhesive in the small spaces left in the intersections of your design. You could leave it like that and hope your cat doesn't decide to hop up on your desk and lay down on it, like I know a lot of your cats are wanton to do! Or you could do what I did and use a small hole punch to punch out a few holes and use a pair of tweezers to pop them into the sticky bits. This turned out to be a, "Well, wudja lookee there!" fantastic design feature. When stuff like that happens, you pretend you meant for it to happen all along. And that's it. 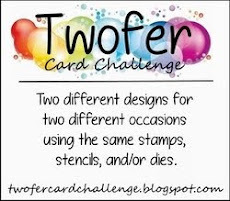 It doesn't take hours; in fact, it might be quicker than a card that needs a lot of coloring or fussy-cutting. Let me know if you have any questions or if I wasn't clear. Isn't that so sweet?! For easy-to-follow directions on how to make this basket, visit Vicky's site: Crafting Clare's Paper Moments! Hi Darnell excellent tutorial would never of thought to use a sticky sheet, thanks for the tip. Happy Easter to you too. Hope it is a relaxing one for you. 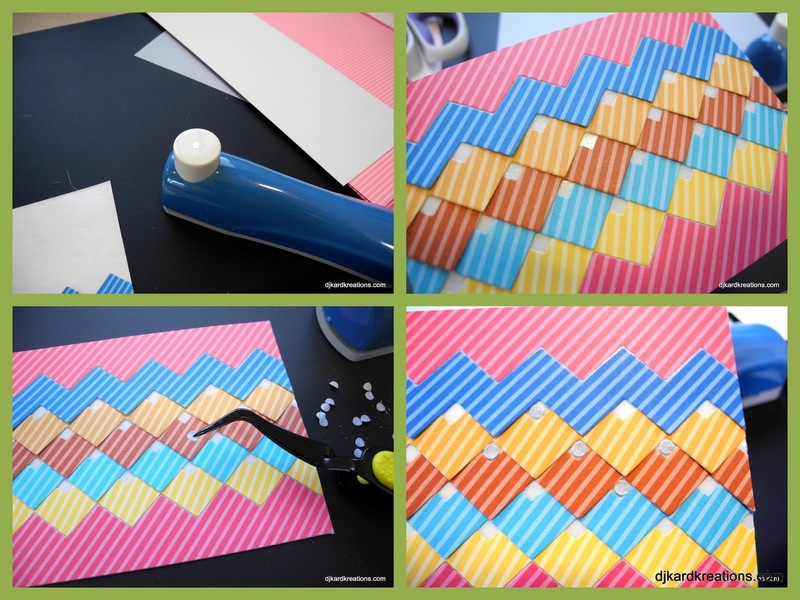 Ooh, lovely chevron weave, and thanks so much for the detailed tutorial. Great cards on your desk... I've missed a few, but happy to be back (and with my mother in tow this time!)... Happy WOYWW! Made me laugh with the mahoosiveness of the roll of tape.. Glad you found a fantastic use for it love the card you made will have to investigate getting that die. You sure would NOT want to mistake THAT roll for your charm' ultra now, would you????? Oh yes, I can relate to your 'big roll' incident too! Ummm, wow, that is a gianormous roll of sticky stuff! But I love happy accidents like this. When I have a massive quantity of something, and absolutely no hoarding desires, my playtime can result in something quite unexpected. Just like yours did here. Was very excited to see you posted a tutorial on your basket. And now I can see how your tiny hole punches came in handy to cover up the last remaining sticky spot (which you probably wouldn't have done if you just put adhesive on the back of the strips to begin with). Yes, It totally reminded me of those gum wrapper chains when I first saw your basket! Thanks so much for the tutorial, Darnell! I like that - rather nice - and has lots of potential for other times of the year, too. Well done with the tutorial. Wow, I love the colours that you've use for the tutorial! Thanks for sharing, it looks a lot more work when finished, huh! Loving the view on your desk this morning - specially the plain card with the big old bow on it....it sorta sums up my card making this week. Without the bow. Gotta love Vicky's basket...haven't done a thing, not one, related to Easter. Shame on me. Just thought I'd pop in before going to bed...getting tired eyes! Is that sticky paper re-position-able (heavens what a word) or is it instant total stick? It looks very useful to me and perhaps a bit cheaper than jac paper. P.S. Somehow a sentence was misplaced but you get my drift. Maybe I can give you a laugh too. Beautiful woven card and ideas. Thank you so much for this amazing tutorial and chuckle. :) You rock! Thanks for the tutorial! I don't have the chevron die (yet) but if (when) I get it, I'll be giving this a try! What a fantastic tutorial thank you so much for sharing that. I love your easter makes they are so bright and cute. I LOVE my score tape! Did you know that you can put it on the paper you plan to cut, THEN run it through the machine to cut...then all you do is peel off the back and slap it down! I wish I had bought the 4.5 inch wide...I would use it ALL the time! Cute, cute card!! Darnell I so love Wednesday`s with you. That is one honkin big roll of Scor Tape!! Love it and I love Scor Tape. Your cards and baskets are fabulous and so is your tutorial. Hi Darnell. Love your tutorial. I'm seeing chevrons now, makes a change from stars anyway!!! That is one massivo roll of tape. You'll certainly never be short of it that's for sure. Love your cards. The chevrons look like basketweave to me. Happy WOYWW and Happy Easter. 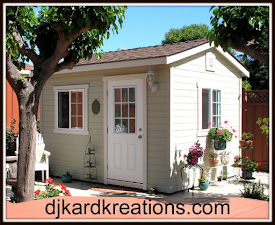 Hi Darnell.. Great cards and wonderful instructions - thanks. That huge roll is fabulous! The card is very neat and I adore the little basket. Fun projects! I learnt a long time ago DJ not to rail against the mojo, you'll just waste a lot of supplies cause you won't like anything that you FORCE yourself to make and you'll be even more frustrated than ever. Right now my mind is telling me to knit, so I knit away! Have a wonderful Easter, I take it you will be partaking in the chocolate eggstavaganza? I mean. you have made all those cards after all! Great chevratorial Darnell! You really did make it look easy! Such delicate and intricate work - despite your great tutorial I can't see myself trying it. I have enough trouble cutting dollshouse wallpaper in a straight line! 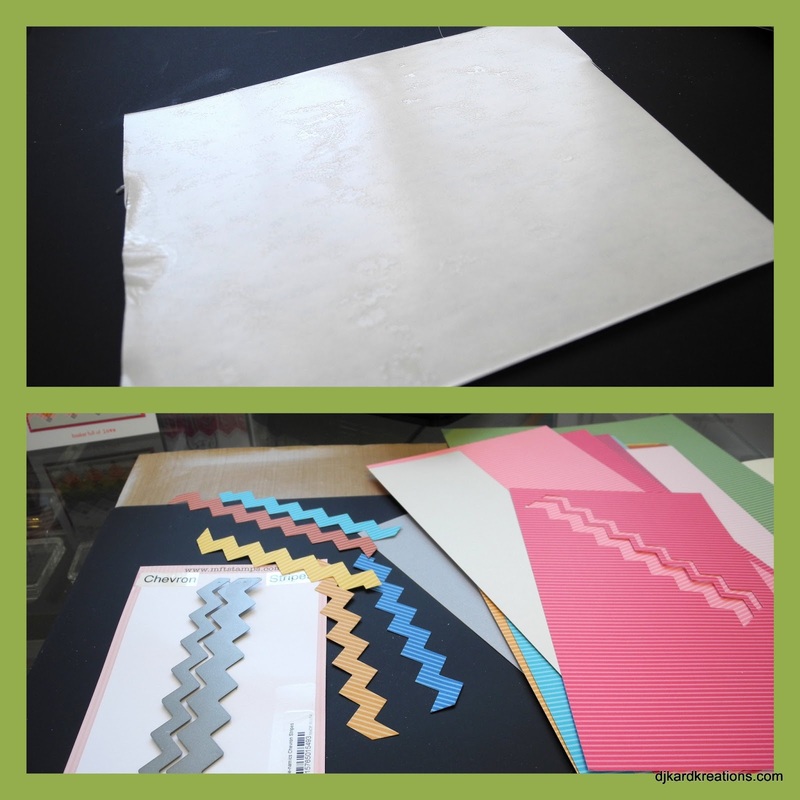 Ooooo, how I love that tape...it is so easy to use...works great with glitter too! 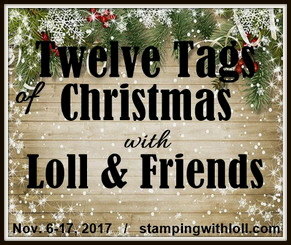 Your cards are so pretty and I am going to show your stickeroos to Little Miss C. She is coming over on Friday and will be drawing tulips on her very first art journal page. She has oil pasteled, and rubbed and burnished, then she has painted over and now she has added paint using lego and perler bead frames as her stamps. Can you imagine my surprise when I was in a little town, Eustis-FLA while visiting my mom, when I came upon a little shop called "My Favorite Things." Could it possibly be THE stamping company? Oh, yes, it was!! It was unbelievable! 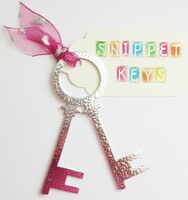 I got the Chevron dies that day, and you are making me happy the way you are using them!! I must get to using them- thanks for the inspiration, friend. This is a great tuurtorial, thank you for the inspiration! Happy Easter/Passover/Sunday to you, too! Thanks for the tutorial! Happy Easter, Passover or Plain Ol' Sunday to you, too! Nice tut! Thanks. Darling basket, actually that should be darling basket(s)! I, too, remember the gum wrapper chains. Kept mine in a shoe box, the thing was so long! What do you suppose the archeologists of future will think when they come across a fossilized one? Things that make ya go hmmmmm. Love spending a bit of my evening with you. You always give me a smile. Wow, I really like the colour arrangement you used! Darnell, the baskets rock! Your faux weaving technique is a necessary pin. Thank you for the tutorial. Darnell, you just crack me up! As always I love reading your posts, it reminds me of watching I Love Lucy, never a dull moment! I thought I'd already commented here :( Must be losing the plot. Thank you so much for showing how to do the chevrons Darnell! And that humungous roll of sticky stuff did make me giggle - slight miscalculation perhaps? Fab tutorial. I am going to have to try this. I love your blog. You always inspire me. Thanks for sharing how you made this ~ hope you have a wonderful Easter with the twinks! 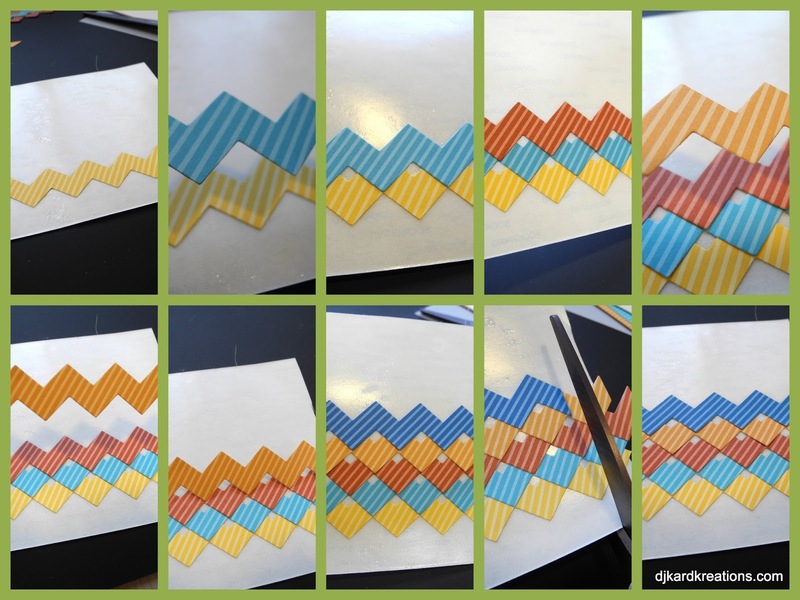 Hi Darnell - just popped over from Di's blog to check out your chevron tut! I love it, so thank you very very much for posting the piccies. I will have to have a go some time. As for the small roll of sticky stuff - you did make me laugh. I do the same and now have three lots of sticky white dot things to put on my pens. The one's I thought would be alright would probably fit onto the end of a dressmaking PIN!!! Oh well - it's good to know there are lots of us about out there. Hugs to you and I really love the card.